Oliver Peoples Signature Series Amory. 18k gold glasseswith expandable temples. Limited Edition. 100% Authentic. This gorgeous faux tortoise shell glasses case is ideal for carrying and protecting clip-on sunglasses or very thin traditional glasses. The top is tortoise shell acetate-plastic and the bottom is black acetate-plastic. Oliver Peoples OP-523 Made in Japan Sunglasses. CONDITION:New Never Worn. (see last picture) Includes Original Case. Earpieces and nose pads are adjustable to achieve best fit. Sunglasses are around 30 years old and show related wear from use and age. Crack on temple. OLIVER PEOPLES EMBOSSED IN BOTH TEMPLES. 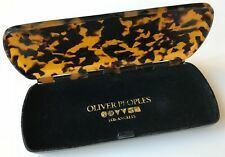 OLIVER PEOPLE'S OP-68 AG ANTIQUE GOLD. MODEL: OP-68 AG. VERY RARE MODEL. HAND-ENGRAVED FILIGREE IN ANTIQUE GOLD. Dream Relics presents an ORIGINAL 1980s pair of OLIVER PEOPLES MP-8 383 P Glasses, with clip on sunglasses and case. Very stylish on every degree! There are prescription. Very collectible in the fasion industry. Oliver Peoples Executive II OV1171T 1171 47. These glasses are in very good used condition. The case has wear marks on the outside. Includes polishing cloth. 20-is the distance between the 2 lenses in mm. 135-is the length of the arm, from one end to the other, including the bend. They were made in Japan. The sunglasses were crafted in Japan in the 1980's of bronze gold-colored and tortoiseshell-effect composite. The brown rectangle lenses provide 100% UV protection for visual comfort and safety. The sunglasses are a size 56 x 17 x 135mm. Right Arm: Oliver Peoples LA 👓 ∆∆ ◽ ◽. THE ORIGINAL LENSES I BELIEVE ARE PLASTIC BUT SHOULD BE REPLACED WITH YOUR OWN LENSES, THEY HAVE A FILM/RESIDUE BUILD UP AND SCRATCHES. FROM THE 1970'S/80'S. GOLDTONE ARMS. OLIVER PEOPLES ! LENS: CRYSTAL ROSE TO LIGHT GREY. This is not from the new collection, this is a sunglasses from 80s/early 90s. Feel free to ask for more informations. 21 mm bridge. 40 mm eye size. Model# - Denison OV5102 1156. Easy to take to an Optician to place your own prescription lenses or regular sunglasses lenses in. Lens height: 30 mm. Lens Width: 50 mm. All available size information will be listed in the title. Oliver Peoples Phoebe DM 59-17-126. We feel lucky to do what we do, to be surrounded by what we love, and we bring this level of dedication to our job. We are here and happy to help. Oliver Peoples Multicolored Sunglasses Polarized Lens MOD. jezebelle Free Shipp. OLIVER PEOPLE'S OP-510 Wraparound Sunglasses. OLIVER PEOPLES 510 Sunglasses. LENSES: G15 Green/Grey Glass Lenses. OLIVER PEOPLES EMBOSSED IN BOTH TEMPLES. OLIVER PEOPLE'S OP-81 AG ANTIQUE GOLD. MODEL: OP-81 AG. VERY RARE MODEL. HAND-ENGRAVED ANTIQUE GOLD. OLIVER PEOPLE'S OP-510 Wraparound Sunglasses. OLIVER PEOPLES 510 Sunglasses. 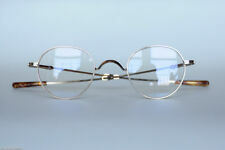 LENSES: Solid Brown Glass Lenses. OLIVER PEOPLES. Oliver Peoplespresent the mod. OP-9 eyenglasses, are detailed in a position to define the entire look, perfectly combining functionality and style. Send the glasses with NO original CASE. Free Gift included: lens care product. Bridge: 21mm. Hand crafted in ITALY. 100% Authentic Designer Sunglasses with 1 year manufacturer warranty. 100% UV protection. Designer case and pouch included. Lens width: 54mm. 100% Authentic Designer Eyeglasses with 1 year manufacturer warranty. Hand Crafted in ITALY. Lenses are prescription ready (Rx-able). Designer case and microfiber wipe cloth included. 100% Authentic Designer Sunglasses with 1 year manufacturer warranty. Hand crafted in ITALY. Lens width: 58mm. Polarized lens and 100% UV protection. Designer case and pouch included. (Oliver Peoplepresent the mod. 0K20 Sunglasses, are detailed in a position to define the entire look, perfectly combining functionality and style. OLIVER PEOPLE. 1)U.S.A OR WORLD. More Informations.